There is an imperative for India and Bangladesh to work together for mutual benefit and for the good of the region. Scholars from the Institute for Defence Studies and Analyses (IDSA) and the Bangladesh Institute for International and Strategic Studies (BIISS) discussed the issue threadbare at a ‘Dialogue’ in New Delhi in May 2011. 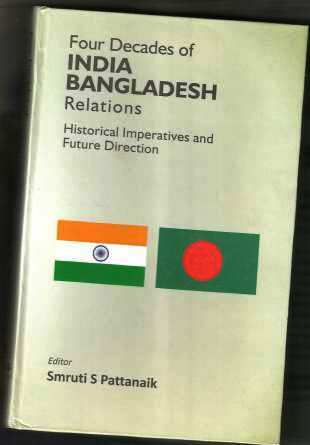 Result is an interesting volume titled “Four Decades of India-Bangladesh Relations: Historical Imperatives & Future Direction”. Brought out by IDSA, the 276-page book (Gyan Publishing House, Darayaganj, New Delhi; Price Rs. 650/-) provides the perspectives of India and Bangladesh, while making out a strong case for out of the box thinking to move forward. And spells out workable models, addressing each of the issues that have bedeviled the bilateral relations in the most clinical fashion one can ever come across. Smruti S. Pattanaik, Research Fellow at the IDSI, did a commendable job as the editor, though proof-readers appear to have let her down at a few places. She contributed two chapters, one titled “Consonance and Dissonance: Issues and Trends in India – Bangladesh Relations”, that has literally set the tone for the ‘dialogue’ in the book under review, and the other on security issues titled “Transcending India-Bangladesh Relations: Framing Mutual Security Parameters”. Dr Shaheen Afroze provided Bangladesh perspective on matters of security. As the Research Director at BIISS, she is in a position to take a holistic view of not only ‘the border- related’ security challenges but also of Indian security concerns that are impacting Bangladesh. Smruti and Shaheen have one message to the policy makers and it is that failure to come to grips with the security concerns could generate mistrust and suspicions ‘that percolate to other areas of bilateral ties’. “For every mile of progress made in respect of bilateral relationship in other sectors, we regress two miles with the death of every Bangladeshi at the hands of BSF”, cautions Shaheen as she argues that both governments should factor in the ‘mood and sentiments of the people’ while resolving problems related to enclaves, border management, illegal migration, cattle smuggling and killings on the border. In short, what the Bangladeshi scholar calls for is a people centric approach. No trickle down theories will work in security or economy. Shaheen’s is a valid point. It cannot be brushed aside. Bangladesh has 51 enclaves (17,000 people) inside India while India has 111 enclaves (34,000 people) inside Bangladesh. The Land Boundary Agreement of 1974 stipulates expeditious exchange of these enclaves but nothing substantial has been achieved as yet. “These large number of people of both countries are deprived of political rights and do not enjoy social facilities that are necessary for development of individuals in a free society”, Indian Foreign Minister S M Krishna admitted in Delhi early May. Security as a theme doesn’t enjoy primacy in the book under review though it crops up at regular intervals. Other issues, notably connectivity and transit are discussed in great detail. This is a welcome development, and reflects the new understanding among scholars and strategic thinkers that it is time to entertain a paradigm shift in planning for the future. As Sreeradha Datta ( Director, Maulana Abdul Kalam Azad Institute for Asian Studies, Kolkata) points out in her article on the subject (Pages 86-97) the various infrastructure projects like a bridge over Feni River (Southern Tripura) India has undertaken in its northeastern region will improve India’s border connectivity with Bangladesh and Myanmar. More connectivity will lead to more border trade and enhanced economic ties. “This is also likely to lead to a spurt in greater economic activity in this region (North-East India) that will eventually enable it to be a large trading partner of Bangladesh”. Analyzing the connectivity challenges (Chapter Six), Ishtiaque Selim (Research Fellow at BIISS) admits that transit facility to India ‘which is more or less an economic issue, has virtually been overshadowed by political interests in Bangladesh’. But recent discussions have brought the economic aspect into sharp focus. According to him, politically, Bangladesh can use the transit as a leverage to settle some unresolved issues with India. Selim doesn’t subscribe to the view that transit to India could drag Bangladesh into India’s internal security matrix and also spur arms and drug trafficking through Bangladesh territory. In fact, he has a rhetorical question to the skeptics: Has the grant of waterway transit to India threatened the security of Bangladesh? Since the answer is in the negative, he concludes: “Hence, the concerns might not be justifiable”. The bilateral trade is also not problems free but the issues involved are far easier to resolve than many others. At the same time closer economic ties could also help in resolving other bilateral issues, says Anand Kumar (Associate Fellow, IDSA). Today there is a large volume of informal trade (estimated at between $1 billion and 1.5 billion in the year 2000). Official trade is, however, engendered by deficit. And it is characterized by a plethora of regulations, absence of information transparency, infrastructure bottlenecks in transportation and communication, and above all ‘rent’ seeking activities of public servants. Anand’s prescription (Chapter Seven) is that Bangladesh should take the lead shown by Sri Lanka and enter into a Free Trade Agreement (FTA) with India to stimulate two-way trade. FTA helped Sri Lanka not only to step up its exports to India but also record a 30 per cent jump in Indian investments in the island nation. Mohammad Mahfuz Kabir (Research Fellow at BIISS) agrees with Anand’s analysis and prescriptions but sees bilateral trade nirvana (Chapter Eight) in India reducing tariffs and removing non-tariff barriers (NTB). “Tariff on Bangladesh products in Indian market is higher than that of Indian products in Bangladesh”, he maintains. Other subjects that came under examination in the book are: trends in Indian foreign policy, regional security environment, international order, water and energy. There can be no doubt that the two countries will be influenced by globalization and market forces, which have made ‘interdependence’ in the modern world a reality. But as Smruti Pattanaik said in the very first chapter, the future direction of the relations would be dependent ‘on how New Delhi manages its ties with the provincial capitals in India, and Awami League’s ability to manage its domestic political imperatives’. India and Bangladesh have a love- hate relationship, more hate than love, probably. This is a legacy of the days prior to Bangladesh’s emergence as an independent nation. Put simply, it is Pakistan syndrome which neither side will ever acknowledge in public. I came across several instances that had lent credence to my Pak syndrome thesis. India played a stellar role in the ‘Liberation War’ of Bangladesh. And if you think that the epoch making event was enough to undo the ‘partition’ legacy, you are mistaken. The 1971 War gave work to cartographers, and food for thought to political egg-heads, who were brought up on a diet of two-nation theory. Nothing more. Nothing less. On the Bangladesh side, the two-Begum politics have made relations with Delhi a hostage to the domestic compulsions. And on the Indian side, ties with Dhaka have become a hostage to the alliance politics which have given an unacknowledged veto to the regional satraps. More over the emergence of radical groups in Bangladesh is an acknowledged reality. Interestingly, Delhi and Dhaka are made for each other. Without cooperation from Bangladesh, India’s security remains vulnerable to cross border infiltration by non-state actors. Bangladesh needs India’s support and back up to realize its goal of becoming an economic hub and a land bridge between East and South Asia. Dhaka has already exhibited a regional outlook by granting connectivity facilities to Nepal and Bhutan, which are hitherto dependent only on the Indian largesse. Both sides are acutely aware of advantages of working together in diverse fields, particularly, energy and transportation. But they have not achieved a breakthrough. Yes, because of the Pakistan syndrome despite the emergence of a new generation in Bangladesh, for whom pre-1971 is no more than a page in history. The old mindset is responsible for the objections Bangladesh keeps raising to Indian plans like construction of a hydro-electric project at Tipaimukh. To be located 500 meters downstream from the confluence of Barak and Tuivai rivers, the dam will save Cachar plains from floods and will produce 99000 Megawatts of electricity within the next 50-years. The project is situated very close to the Indian border with Bangladesh. But in Dhaka, Tipaimukh has been generating much heat. One of the objections is that the dam could induce earthquakes in the ecologically fragile lower riparian Bangladesh. Will India be not affected in the event of an earth quake? No Bangladeshi commentator has fielded the question while going hammer and tongs against India. Yes, another instance that justifies my Pak syndrome thesis. It can be no body’s case that India should not factor in the concerns of the neighbour. Availability and reliability of water is important for the food security of Bangladesh which is devastated year after year with unfailing regularity by cyclones. Leadership of the two countries should, therefore, sit together in good neighborly spirit and resolve differences with some give and take. Earthquakes, like money, have no colour. So is electricity. Even one megawatt of additional electricity is a bonus for the power starved Bangladesh as India has agreed to sell to it any surplus power of the generating stations in the border belt. More food at home would mean few illegal immigrants to India in search of work. In short, the management of internal dynamics by Delhi and Dhaka would decide the course of events with or without Pakistan syndrome. Hopefully. This entry was posted in Book Review, News and tagged and Tuivai rivers, Bangladesh, Bangladesh Institute for International and Strategic Studies (BIISS), IDSA, India, Tipaimukh. Bookmark the permalink.